This section describes the tools found in the Yandex Map Editor interface for moderators and techniques for working with the service. View the list of moderation tasks that are located in your zone of moderation. You can also edit the order of tasks in the list (from newest to oldest or vice versa). For more information, see the View and configure task list section. Accept user edits; the ones you accept end up on Yandex.Maps. For more information, see the Task moderation section. Block and unblock users; view a list of blocked users. For more information, see the Block users section. — The Moderation areas tab displays all relevant moderation areas Click on a name of a moderation area. The Moderation panel will open and display a list of tasks (edits made in the zone you selected). See the Viewing and configuring the task list section. The Banned users tab displays the banned users list. See the Banning users section. Your list of moderation areas. Click a name of a moderation area. The Moderation panel will open and display a list of tasks (edits made in the zone you selected). The Completed moderation tasks button. 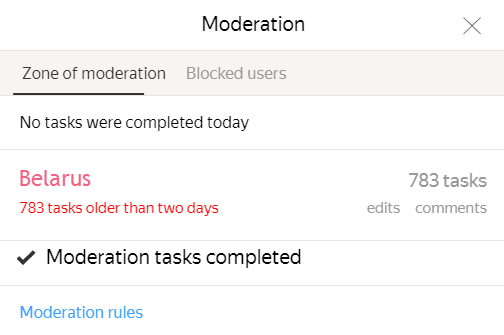 Click the button to see all the moderation tasks you've completed. After opening the list, you can view or edit each task individually. The Moderation rules link will take you to this Rules page. Deletion requests that a user added to an item. The task queue is generated for each moderator based on their moderation zone. That way the moderator can concentrate on the same type of edits and work more effectively. In the Moderation panel, click on the name of a moderation zone. The Moderation panel will open and display a list of tasks (edits made in the zone you selected). If necessary, you can filter the tasks by username: enter a username in the “Filter by username” field and the list will only display tasks that relate to edits made by that user. Select a task type (All types / edits / Reports / Deletion requests) and only the types you select will appear in the list. Select a map item category to connect tasks to (All tasks / Administrative divisions / Address points / Buildings, etc.) and only the tasks that relate to that category of items will appear in the list. Open and configure the task list (see View and configure the list of tasks). Click on the text of the task you want to moderate in the list. Go to history: opens the item history panel. Edit: selects the item on the map and switches it to editing mode. Click on the button to reset the task list filter for the item you selected. If you position the mouse over the category icon, the icon (Link to this task) will also appear. Click on that icon to open a new map window where the item and task you selected are highlighted. These denote that the task a “doubtful edit”. You should pay close attention to these type of tasks. — edits made by blocked users. If an edit made by a moderator or expert gets to moderation, it means that the author of the edit has a lot of experience drawing other map layers, but is not an expert in the layer type that the edit concerns. Generally, these edits can be trusted. If an edit made by a blocked user or novice gets to moderation, then you should check it carefully to make sure that it doesn't contain any novice errors or marks of vandalism. Accept: changes the map item's status to "accepted by moderator." Defer — removes the edit from your moderation queue for two hours. If you are the only moderator for that moderation zone, the edit will return to your queue in two hours. If there is another moderator for that zone of moderation, then the edit could go to them (and they might also choose to defer answering it). Undo: cancels all edits to the item that were made after it was last accepted by the moderator. The item's condition will revert back to what it was when it was accepted by the moderator. Vandalism ( ) — undo edits and tell the user that their “Edit was determined to be vandalism” without blocking the user. Message ( ) — open a text-entry field where you can write a message to the user that made the edit. To send a message, click Send; otherwise click Cancel. Open and configure the task list (see Viewing and configuring the task list), or from the panel Moderation link to Comments go to the comments list. If you agree with the request, click Accept. In the request that opens, confirm that the item should be deleted (click Delete) and the item will be deleted from the map. To reject the deletion request, click Cancel. If you don't agree with the request, click Reject. The deletion request will be rejected. Click on the Go to history link. The map-item history panel opens. Click (Show map item) or press Backspace. In the attribute panel that opens, click (Additional). Select Delete in the menu (or press Ctrl + Del). The item will be deleted from the map. View the list of users you've blocked. In the list of events (see 2.10.8. Item: history), or in the list of tasks (see ), or in the list of comments (see 2.10.7. Item: Add commentand View complaints and comments) Press the username. The user's profile opens and you'll see a Block button. Check the box that confirming that the “User is being blocked in accordance with the rules”. The reasons for blocking are listed in the section 1.3.3. Rules for blocking a user. Click Moderation and in the Moderation panel that opens, go to the Blocked users tab. The names of blocked authors are marked . Click on the user's name; the user's profile opens and you'll see an Unblock button. In the list of blocked users (see the View the list of users you've blocked section) click on a name. The user's profile opens and you'll see an Unblock button. Click Moderation in the Moderation panel that opens, then click Comments. A text-entry field opens where you can write a comment for the author. To send a message, click Send; otherwise click Cancel. The comment you selected will be deleted. Click Moderation in the Moderation panel that opens, then click Edits. The map-item editing panel opens. 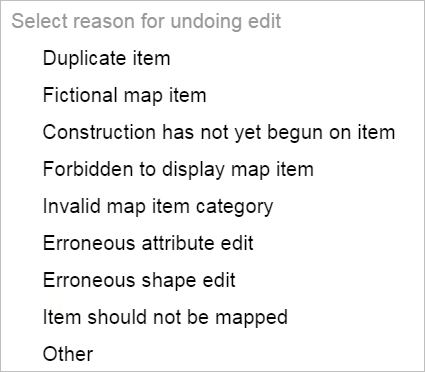 The process for deleting an item from the map (if, for example, a user reported that the item doesn't exist) is described in the Delete a map item section. In the list of events (see 2.10.8. Object: history), or in the task list (see Viewing and configuring the task list), or in the list of comments (see 2.10.7. Item: Add commentand View complaints and comments) Press the username.